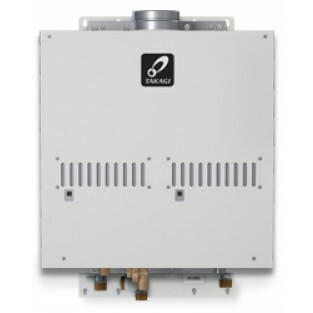 The Takagi T-M50-P ASME Liquid Propane Indoor Tankless Water Heater is designed for residential and commercial applications. This model is loaded with features including freeze, surge and overheat protection. At 380,000 BTUs/hr maximum input, this tankless water heater can supply 6 showers simultaneously in warmer climates. It features an electronic ignition system and requires 5 inch diameter stainless steel vent pipe and can be vented either through the side wall or up through the roof. The Takagi T-M50-P ASME can be installed outside also using the 9007677005 Outdoor ventilation cap. The TM-RE30 wired remote control is an optional accessory.